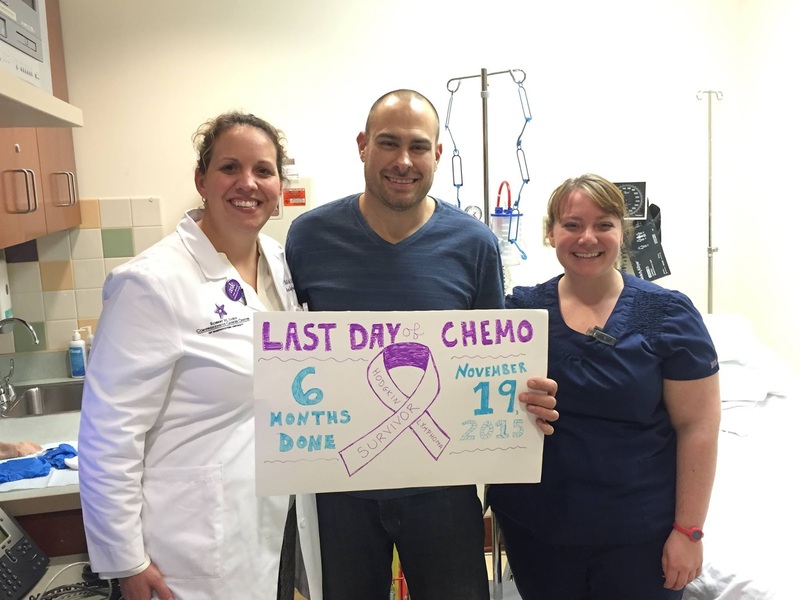 Lake Michigan (and beyond) Boating Adventures: Update from Ben: Last Day of Chemo!! Update from Ben: Last Day of Chemo!! After 6 long months of chemo, my sentence has been served and I've been freed to live my life. I've had so much support and prayers from friends, family, and the amazing staff at Northwestern Memorial that I never felt alone in my fight and for that I'll forever be grateful. Thank you to my awesome nurses Kendra and Betsy who calmed all my fears from day one and had remedies ready for all my symptoms. I couldn't have asked for a better oncology nurse than Kendra and we will miss seeing her every other week. Cancer has forever changed my life. It showed me that life is short and can change in an instant good or bad. All the little things I used to constantly stress about seem so unimportant now. I've realized that nothing is more important than spending time with friends and family, and living life to the fullest every day! It has shown me an inner strength I didn't know I had and left me with a quiet confidence to take on whatever the world throws at me.